Hippocrates is said to be the “father of western medicine,” since I practice TCM, I’m not so sure, but what I really do like is his quote, “let food be thy medicine and medicine be thy food.” I also appreciate the part of the Hippocratic Oath that talks about “first do no harm,” this is the root of the Gerson Therapy, which is probably why Dr. Max Gerson named the very important component of his therapy, Hippocrates soup after him. Hippocrates soup is an integral part of The Gerson Therapy. On this diet it is required to have at least 8oz with lunch and 8oz with dinner every day. This soup is made fresh every other day. The ingredients are really pretty simple and we are lucky that even the local Fred Meyer (mega chain grocery store) carries the most challenging ingredient to find… celery root. We are especially lucky that we live in Portland with so many amazing co-ops that offer so much amazing produce. I would honestly say that I find this soup pretty bland, but there are some great garnishes to add to make it so tasty. The most simple addition that I find really makes it taste so good is ginger,* just grate some fresh ginger root to taste and yummy!! Another easy addition is a little lemon juice… this is Dan’s favorite way to have the soup. I personally like both and then add a little cilantro or basil… muy delicioso!!! *Ginger was an ingredient that originally not allowed on the Gerson Therapy, but now it is allowed and of course anyone on the Gerson Therapy should check with their Gerson trained MD to make sure it can be added to their program. Onion and leek are warming and moving, they nourish Lungs and Spleen to help reduce phlegm in the body. Celery and celery root are cooling and cleansing to the body, the salty nature helps to dissolve masses. Tomatoes are strengthening to the Spleen and Stomach; help alleviate thirst by promoting body fluids. Parsley builds blood, is warming and drying, which is great for Spleen and the pungent flavor enters/supports the Lungs. Potatoes are neutral and sweet in flavor which tonifies the Spleen/Stomach. Garlic is very pungent and warming to help dissolve masses, purge toxicity and parasites from the body. Together all these foods and herbs work together to build the Spleen and Stomach energy to improve digestion and build qi. They also help to dissolve masses in the body to reduce tumors. It is interesting that many of these foods are also high in quercetin which is considered a strong antioxidant that is proven to prevent and breakdown cancer cells. 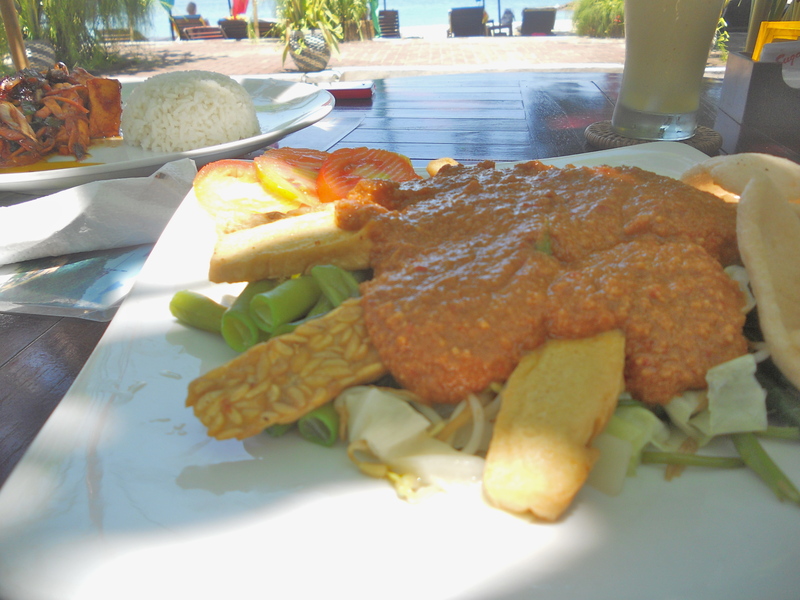 Here is a list of some traditionally vegan and gluten-free recipes found in Indonesia. Many dishes are already gluten-free due to much use of rice, mung bean or tapioca flour over wheat flour. But you still have to watch out for soy sauce in dishes for flavor. The main non-vegan item in Indonesian cooking is chicken stock in rice and noodle dishes as well as shrimp paste that is used for flavoring many savory dishes. The dishes listed below don’t traditionally have either of those non-vegan ingredients or contain gluten (unless otherwise noted). The recipes for the dishes I have listed found from www.indonesianfoodrecipes.com, a very helpful website for recipes on how to make many traditional dishes. I love all the desserts made from glutinous rice (this rice does not contain gluten, it just has that name because it is sticky). Glutinous rice is also called sweet sticky rice or mochi rice, since it is the rice that mochi is made out of… one of my favorite desserts! This is not a complete list by any means and of course any restaurant or chef may have a different version of these recipes, I just thought it was a good place to start.